Backpressure question - Miata Turbo Forum - Boost cars, acquire cats. I measured my exhaust system backpressure to see if things were flowing fine. The car is a '98 ('99 for US folks), with an MP62 - 130/65 mm pulleys, 9.00:1 pistons, ported and reworked head, Skunk2 TB, custom CAI, 2001 style header and custom 2.5" exhaust with two resonators, a large Borla, and no cat. 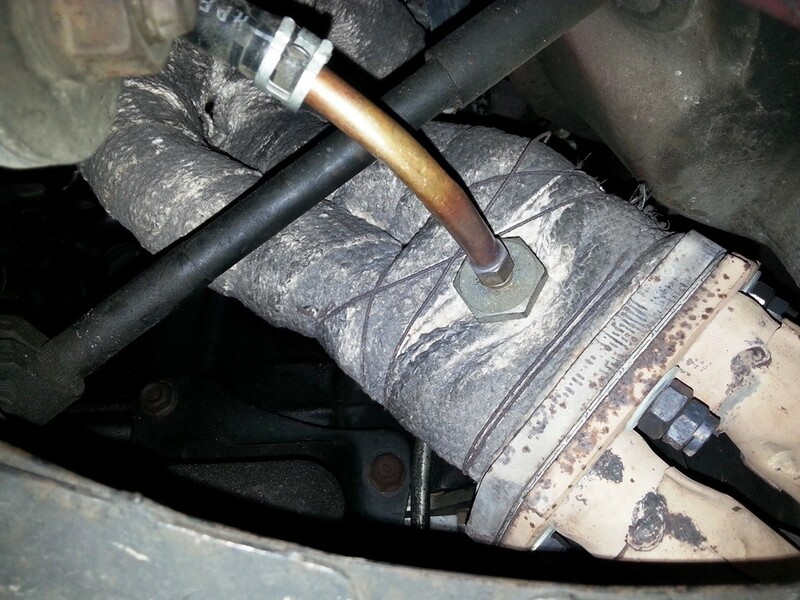 A copper pipe was threaded into the tapped plug, and ultimately connected to a MAP sensor that drives my boost gauge. I thought this would be a good location for backpressure readings. I did one full boost (12-13 psi) run to redline in second gear, and recorded 4 psi. Considering this is a FI setup, should I shoot for 0 psi by going with a larger header and a 3" setup? Is the Borla a straight-through design? Look for the bottlenecks. You should measure the backpressure at the inlet of the Borla too. The thing is, I'm pretty confused about backpressure... Some say you should not have ANY for a FI engine. As for the Borla, I really do not know for sure.. It was a "gift". If you have no backpressure, then there is no flow. I would bet you can get several PSI of fluctuation based on how you measure it, it's not like you're measuring still pressure inside of a pressure vessel. By correctly implementing the bernoulli principle, you may be able to change the sensor position and/or mounting technique while changing nothing else and read 0 or negative PSI. Having minimal backpressure is not important for FI applications - it is important for Turbocharged applications. You have an FI application which is not a turbocharged application. Your aim should be to evacuate exhaust gasses most quickly/efficiently before they cool which increases density. A car with a supercharger should benefit most by using the same or similar exhaust to a high-performance N/A exhaust. Perhaps slightly larger to account for the increased volume of exhaust gas, but no so much that it comes close to the size of a turbocharged car's exhaust system. Can someone with solid knowledge get in here. None of that makes solid sense to me. That doesnt sound right to me. If the pressure sensor is connected to a pitot tube in the exhaust system, I would agree with you. But if it is a static pressure measurement coming from a port in the side of exhaust pipe, then the pressure should just represent backpressure resulting from restriction. If there is no restriction, there is no pressure, and the reading is independent of flow. I honestly do not think any engine really benefits from back pressure, regardless of being turbo, supercharged, or NA. I am aware of how many motorcycle engines will not perform well with a straight pipe, with the argument usually being that they "need some backpressure", but I am not convinced. My theory is that a super high performance, production engine (like a sportbike's engine) has oversized exhaust ports, primaries, secondaries, and exhaust tubing which is being used to make up for the fact that it is going to have to use a restrictive muffler. If it were being designed to operate in the same band but with a straight pipe it would be smaller diameter all along the exhaust system and would perform better. My experience with car engines, which are not tuned-up as much, is that there is no point at which this problem exists as long as the header isnt oversized. Running a straight pipe will make more power, even if its pretty small. I do agree with the idea that you have real incentive to go really big with turbo exhaust just because it will help with spool. Plus with the high backpressure created by the turbo, which is killing scavenging, every little bit helps, probably more so that with supercharged setups which tend to have excellent exhaust scavenging. I would like to know as well. I remember 2 stroke engines relying on exhaust manifold design to help "pull" out exhaust, and it wouldn't run well without it. IIRC the deal with the tuned pipes on a 2 stroke is that its actually using a pressure wave going backwards into the chamber just before the exhaust port is covered to increase the pressure in the chamber. I guess it works because so much of the exhaust is un-combusted air and fuel? 2 strokes are borderline wizardry as far as Im concerned. I think the 4 stroke equivalent of this would be the kadenacy effect, which is basically the inertia of the exhaust gasses exiting the cylinder creating a vacuum which helps draw more air in during the intake stroke. This is probably the biggest reason you want high velocity in the exhaust system, especially in the ports and header. My twinscrew supercharged car used to have a JR header, and I have dyno plots showing a .5whp and 3-4wtq increase at 214whp with the header. From what I heard, exhaust isn't quite as important for supercharged cars as others, because of the exhaust being under pressure from the boost. Its still important for turbo cars due to better spool, etc. At least that's how I understand it. That being said I'm still on the look out for an raceland header for tq and less weight. Back pressure is never ever the goal. 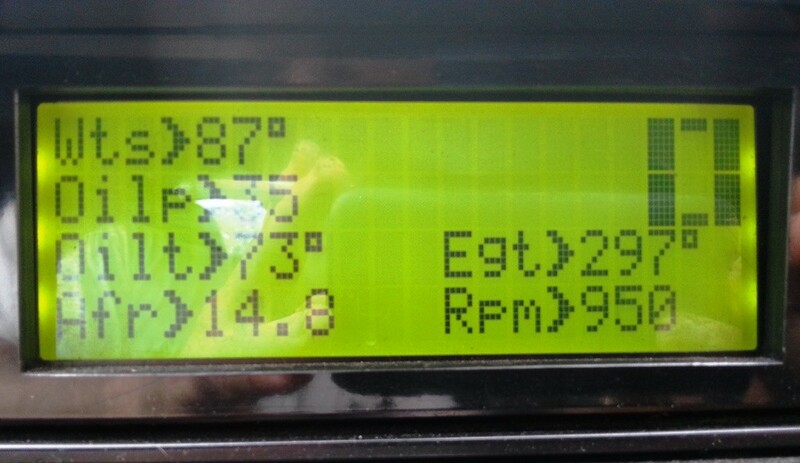 Backpressure is bad on turbo cars and non turbo cars. Back pressure is only a measure of resistance to flow and not a measure of the presence of flow. And the problem with a straight pipe on some naturally aspirated engines is that it can destroy the scavenging effect that has been carefully tuned in to the exhaust design by the manufacturer. The scavenging effect is the difference between highly prized tuned headers and just a cheap set of pretty headers that have not been created by a scientist in a lab. Math is important to engines. Restriction * Flow = Backpressure. So, no restriction, no backpressure. No flow, no backpressure. You want flow, so to reduce back pressure, reduce restriction. Zero is the goal, but is not possible with an exhaust system. The OP question is what is reasonable, and Jason is trying to answer that question. ive read up on this quite a bit lately as it applies to n/a sbc v8s. and from what i understand, backpressure is no bueno for any and every setup. the engines need a little back pressure thing is a myth. they need scavenging, and with that comes a little back pressure. as david vizard puts it, there are more gains to be had with great scavenging and a little backpressure than no scavenging and no backpressure(like the straight pipe coming right off a head). he dedicates a whole section of one of his books to this topic. its on google books, im trying to find it. to answer OPs question, get as close to 0 as possible while retaining scavenging and velocity. iirc on some of vizrds highly developed all out race setups he was measuring less than 0.2 psi. Last edited by hi_im_sean; 11-29-2014 at 11:45 AM. Back pressure should ideally be below .5 psi at 2000 rpm any more and you have a restriction. From an exhaust standpoint, a supercharged engine is basically a normally aspirated engine with a power/flow bump. Scavenging is king, and, of course, back pressure plays a role in that. There are calculators out there that give recommended pipe diameters vs. HP. Worth a look. In your particular case, you would get much more out of an aftermarket header mated to your existing 2.5" exhaust than you would get from a 3" exhaust by itself.